God has blessed us with two children, Joseph Celso and Eunice Lauren. They have brought us so much joy and challenge on how to raise them. It is our desire and prayer that they too in God's perfect time will come to know Christ and serve also in the ministry. I just celebrated my birthday. Since the start of the month, I have made self reflections of what I am now and compared the past years of my life. God made me realized of the things that I needed to work on to keep me growing in faith. It also made me grateful for everything I have in my life and desired to want more of Him. Remembering my childhood days, growing up in a Christian family, I got used in going to church every Sunday attending Sunday schools. It was my mother who was really eager for us to be present during service programs and activities in the church. She have done the best she could so we can be guided in the principles written in the Bible. In which I now consider to be the very best gift I had from my mother. The turning point of my life was when I started to seek God's will of how He can use me. My Sunday school teacher encourage me to volunteer and start teaching children cause that time I will be finishing the Sunday School curriculum for children. I didn't know what she saw in me for her to consider me to volunteer as one of children's Sunday school teachers. I hesitated so much thinking if I can really make it. My teacher was so persistent encouraging me to do the task. She really needed volunteers who will take care of the children during worship service hours. Maybe it was because of the pressure why I joined the teaching staff for children. I believe it was the start of God's call - being in the ministry where He wanted me to be. I find myself to like children and enjoy teaching them. I could also remember one of the first ministries of Christ's Stewards Fellowship. It was the event under the bridge - a 5-day club. I could no longer count how many students I have taught and the Bible stories that I have told and people that I met because of this ministry. At times I got surprised when some of them would just greet and say they became one of my students. God has placed this burden in my heart to reach for these children. We live here in the busy streets of Batangas City. Our church is just located in the market. Everyday we see lots of people and lots of street children too. There was this one time that I am walking going home when I saw a group of children in front me who were also walking. They just caught up my attention and started to observe them. They are talking about something, then they smiled at each other, as soon as they reached the mango stall, one of the little girls simply piked the mangoes arranged in the basket and secretly hid it her pocket without the vendor noticing what she had just done. The children continued walking like nothing happened and I can also pretend that nothing happened too. I found myself walked faster just to reach those group of children. I simply whispered and say "I have seen what you have done". She looked in my eyes, I saw her face shivered then ran back to the stall of the mangoes and returned what she had just picked. Little things can be done just to make a difference at all in the sight of these children. I know there is a big ministry that all of us Christians should do for these children. For many years I have been serving in the children ministry and have also been a part of Child Evangelism Fellowship here in Batangas City for 5 years now. For me year 2010 was so sad that almost all of the churches here in Batangas City and I know even the whole country and churches abroad have experienced financial difficulties because of the worldwide economic recession. What makes me sad is that almost all of the churches here in Batangas City chose to cut their Children Ministry budget. Dorothy, our CEF area coordinator and at the same time our children ministry leader asked me if we are going to continue the 5day classes we have planned for the whole year including the Vacation Bible Schools. She knows also how tight our budget is and as she sees we can't also make it. We might not have the same budget as before but I couldn't postpone the ministry for monetary reasons. By faith I know God will provide. I missed going and teaching children. Since the time I gave birth, it was the time I could no longer go out and teach. At some times I can teach but it is now very limited unlike before. But I am also happy and fulfilled to see that some of my students before were now part of our teaching team. They are now part and are active members of our Young Stewards Fellowship and also find passion teaching children. 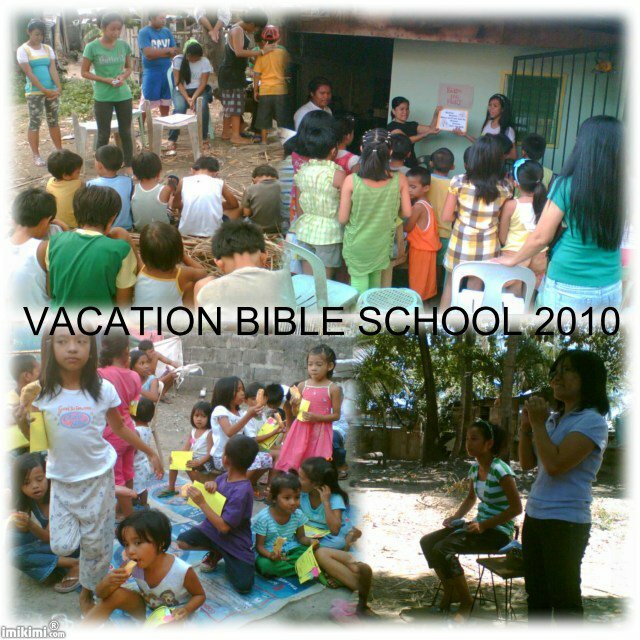 Last summer, they went out to four Barangays and reached children for Christ. God provided the budget we needed and successfully made it to happen. Children Ministry has been and will always be a blessing for me. I have learned so much from these children even though I am their teacher. In their deeds and action God has spoken to me most of the time. At times when I am discouraged, I see strength and faith in them. For my two children they have been a source of joy in a depressing moment. Through these children's lives I have reflected at times and got rebuked of wrong examples I've shown. These children might not know how they have become a blessing and might not even noticed they have given a gift. For us it is a continued challenge to reach for these children. They are weak and helpless they need Christ the best gift that we can give back to them.